Maria Reardon has become known for her intimate glimpses of life at VMI. With her latest collection, we see her gift for capturing the hidden moments at VMI, along with her love of the iconic Lexington views. Not to mention the beautiful scenes of her beloved Goshen. During April we highlight the works of plein air pastel artist, Maria Reardon with her show “Around Post and Uptown.” Her new collection will be on display through the month of April, but come early, her work is going fast! Pictures really do not do these paintings justice. See them in person today! 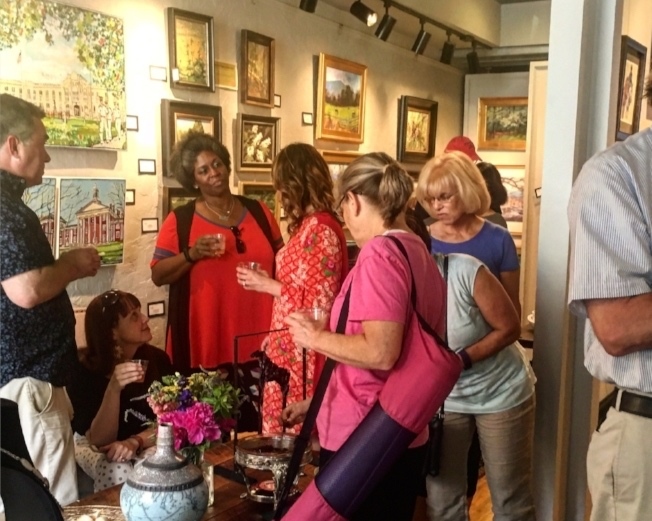 First Friday fun at the Cabell Gallery! Cabell Gallery gift certificates make the perfect gift! The Cabell Gallery focuses on fine art from regional contemporary artists, emerging and established. We have a variety of original paintings, oil, watercolor, acrylic and pastel, along with clay works, art glass, jewelry, furniture and other artistic objects. Please browse the Artist section of our website and see the work that we currently have in our gallery. Of course every effort is made to keep the website current, but we do have constant change in our gallery. Visiting in person will give you the most complete view of our selections.